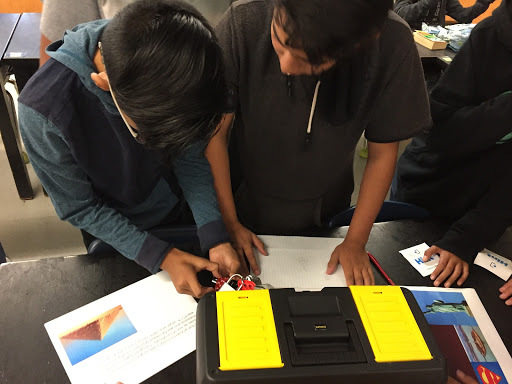 I ran my first BreakoutEDU game with my 7th grade science students last February. It was an incredible experience for my students and me; even though they didn’t break out, we had a great debrief and were able to critically look at the skills needed for perseverance and problem solving. In March, Justin Birckbichler and I started building digital versions of the breakouts, which ended up being quite the project. We found that many teachers struggle with the productive struggle just as much as our students, and we put great value on teachers modeling the critical thinking process alongside their students. In order to ensure more flexible and resilient adults in the future, we must explicitly teach and model these skills for our students. Fast forward to now, my 8th grade AVID students just finished creating their own Breakout EDU games! They used what they learned in their career research project within their game. It was a very challenging process for both myself and my students–just like when I facilitate games, I did not step in to help them more than absolutely necessary. In other words, I allowed some of their clues to fail. Why? That’s where the learning takes place! 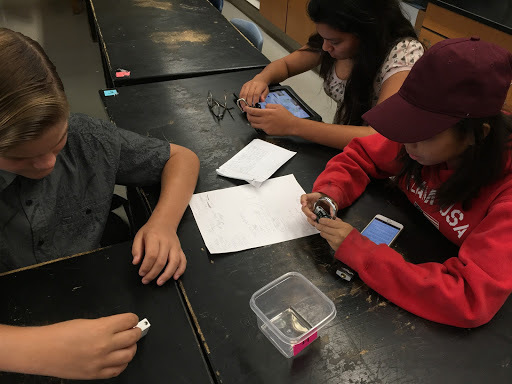 My students had already played a few physical and digital games, and were familiar with the skills needed to successfully play Breakout EDU games. They were excited about creating their own games, and we talked about what elements make a successful game (story hook, interesting topics, clues that are not too hard but not too easy), then they launched into their game building. 1. I randomly divided students into groups of 4 or 5. 3. I gave each group a basket with 4-5 locks. Students decided who would create the clue for each lock. 4. Students created their clues on shared Slides. 5. I programmed all the locks and printed the clues. I programmed the locks ahead of time based on students’ planning docs, and had each set of locks separated and ready to go. Each team facilitated their own game. I had them fill out a reflection graphic organizer as their peers played their game. This served two purposes: it kept the facilitators busy so they didn’t become too vocal and it allowed students to reflect on the process of designing and facilitating their own game. It was incredible to step back and watch my students play and facilitate their own groups. Some students tried to ask me about specific clues during the game, and I directed them to ask the game creators. It did not go perfectly, and some of the clues were confusing, but that’s all part of the learning process! One group particularly struggled with designing their game. They lacked teamwork and cohesion, and it showed in their final product. While playing, they realized that one of their clues made no sense to their participants: it was a math problem, but the resulting code was random numbers from that math problem. It was SO hard for me to not jump in and rework their clue to make sense. I had them go outside to discuss how they could change their clue on the fly, then come back in and give the participants a hint. They had to go back outside multiple times before they had a solution. The whole process took over 10 minutes, and many failed attempts of guiding questions from the facilitators to their peers. It stretched their brains, but it also taught my students how to think on their feet. We had great discussions after playing the games. Students shared what they found was successful, challenging, and what they learned about themselves in the process. We focused on the positives and constructive feedback, and how we can learn from this. Use at least 3 characteristics from the Vikings’ Code to answer the following questions. Remember to use specific examples in your writing! – Describe your experience designing your own Breakout EDU game. – Describe your experience facilitating the game you created. – Describe your experience playing your peers’ games. If I had a dollar for every time a student said “Ms. V, this is hard!” during the game creation process, I’d be rich! I knew this process would be tough, but I didn’t anticipate how much we would all learn. The formal and informal debrief conversations brought out many great ideas and learning opportunities. 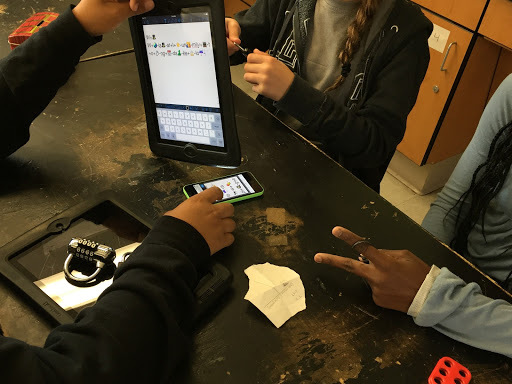 – My students wished they had a chance to test out their games before their peers played. In the future, we will build in a peer review process within the game design. – Students quickly realized that creating critical thinking opportunities is significantly more difficult than critically thinking itself. 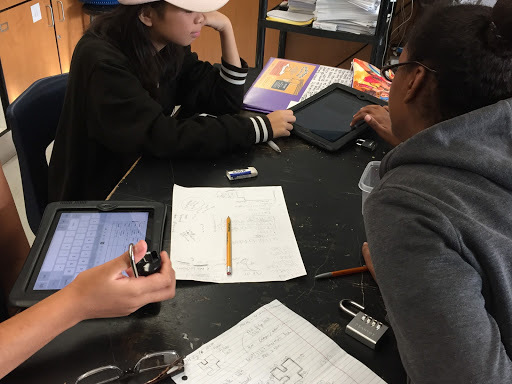 – As hard as it is to step back as a game facilitator, it’s even harder to step back while students are designing and facilitating their own games. They have to experience the highs and lows themselves, without me stepping in to fix everything. My students are excited to share their games via another teacher at the AVID National Conference in December. They are revising their games, testing them out on teachers and students at school, then submitting a final draft game. Students will have another chance to build a game in the spring, and this time we’ll open it up to physical or digital games…content or purpose to be determined. Our incredible #SunchatBloggers group decided to embark on a few group topics, the first one being our “top 5” of anything education related (here’s our top 5 Padlet). I love the opportunity to share blogging ideas and topics with this dedicated and lively group. We recently started a #SunchatBloggers Padlet to show off our favorite blog posts. It was tough to come up with a topic for top 5, and move beyond my current top 5 favorite apps/tools (which also would be fun!). Lately, introverts are especially on my mind. I moderated #WeirdEd on October 5th and we had an incredible conversation about the myth of introverts and how we can celebrate their value in our world. On October 9, I did my first ever Ignite session at the San Diego GAFE Summit. I had just 5 minutes to inspire attendees with a mini keynote. I decided to take a risk and share my story: I’m an introvert in a very extroverted edtech world, and it’s mentally tough to keep up my energy sometimes. I shared about how introverts process the world internally, while extroverts socialize instead. Our introverted students are less likely to advocate for their own needs, including when they need to work alone and/or in a quieter environment. I feel encouraged because many people I look up to have told me that this is a message that needs to be shared and spread. 1. Shift classroom discussions and questions onlineUse tools such as TodaysMeet or Google Classroom discussions to engage all learners. Allowing students to use an online discussions with threaded or @ replies gives plenty of room for introverts to enter the conversation when they are comfortable. Additionally, using an online discussion for students to ask content and class specific questions allows more students to speak up; it also empowers students to take ownership of their learning and help each other. If you’re ready to take a bigger leap with students, start blogging as a class or individual student blogs. I’m just starting this process with my 8th grade AVID students, and hoping to use blogging in science in the next year (2017-2017 goal?). In and around your classroom, create distinct workspaces with different working guidelines. Designate a large group work zone, a small or partner group zone, and/or an individual work zone. I’m in California, so I’m lucky we generally have good weather so we can expand our work area outside to the hallway (unlike all you East Coast friends, our schools are generally not one building with interior hallways). Often inside my room is the louder group work area, and outside in the “Venturino Zone” is for quiet work. The “Venturino Zone” is my pre-set boundaries between my classroom door and the poles at the end of my classroom. Collaboration and group work does not have to happen face-to-face, or even in real time. Digital collaboration isn’t a less valuable form of collaboration; it is just another way for students to work together. My students are able to quietly work together on projects, and those with quieter voices are still able to share their ideas. Additionally, introverts will feel less social exhaustion when they are not required to interact as frequently. As an introverted teacher in the edtech community, most of the work I do and projects I’m working on happen asynchronously and through collaborative platforms such as Docs. Furthermore, last February, some of my 7th grade AVID students and Rosy Burke’s 5th graders collaborated on the NASA Cassini essay contest. They used Docs to introduce themselves, brainstorm, write their essay, and edit their work. On the last work period, our students were able to quickly conference using appear.in to meet and share final ideas. It was such a cool experiences for all of us! According to a 1972 study by Mary Budd Rowe, teachers rarely wait longer than 1.5 seconds after asking a question before calling on students for responses. She found that when teachers wait 3 or more seconds, there is an increase in students volunteering, decrease in “I don’t know” answers, and an increase in quality of responses. For introverts especially, wait time is critical for them to process their ideas and formulate a response. In grad school, we learne to wait 5 seconds. I was in a good habit in my first couple years of actually counting to 5 in my head. Recently, I’ve tried to bring back the habit. I’m not perfect, but I’m working on it. Give students an objective or essential question as a starting point, and empower them to pick a tool or method to prove they learned. Providing students choice does not mean a free-for-all where students can do whatever they want, whenever they want. Use a menu of options or a HyperDoc to scaffold the choice-making process by suggesting apps or tools for students to use in their task. I’ve found that my students are more engaged and complete better quality work when they are given a few options for a product. I’m thankful to spread the message and be an advocate for introverts in the world. And, I’m especially grateful that I can use my blog to share my own voice, which I wouldn’t otherwise speak up to share. 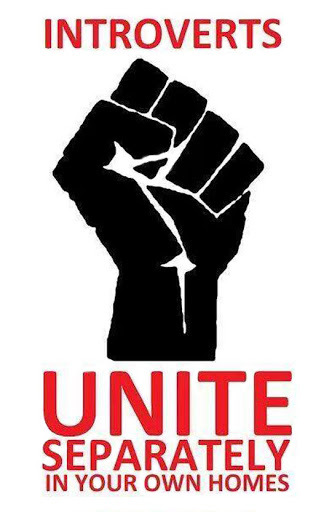 So I leave you with this: How will you empower all voices in your classroom? Trends in education focus on buzzword categories of students: English Learners, special education, homeless/foster youth, gifted, etc. If we’re not analyzing data, then we’re busy talking about getting students to collaborate and work together more. What happens when a student doesn’t prefer to work with a group? What happens when a student is an introvert? Susan Cain, the author of Quiet: The Power of Introverts in a World That Can’t Stop Talking, discusses how western culture has made a shift from the “culture of character” to the “culture of personality” where extroversion is dominant, and introversion is considered inferior. She names this the Extrovert Ideal, defined as “the omnipresent belief that the ideal self is gregarious, alpha and comfortable in the spotlight.” These are the values we intentionally and unintentionally translate to our classrooms, schools, and workplaces. The biggest misconception about introverts is they have less to say. In reality, the major difference between introverts and extroverts is that extroverts prefer to process the world externally via social interactions, while introverts process the world internally via quiet thinking. Introverts have just as much to say as extroverts, but won’t readily speak it out loud. In social situations, there may be extroverts who will not wait for others to speak, and overpower the quieter voices. We call these steamrollers. In any sort of collaborative grouping, an overpowering person can be dangerous for the group’s process and rapport. Helping these extroverts identify when they tend to steamroll is just as important as empowering the introverts to advocate for their own needs. Many introverts, such as myself, can be “functional extroverts” for short periods of time. 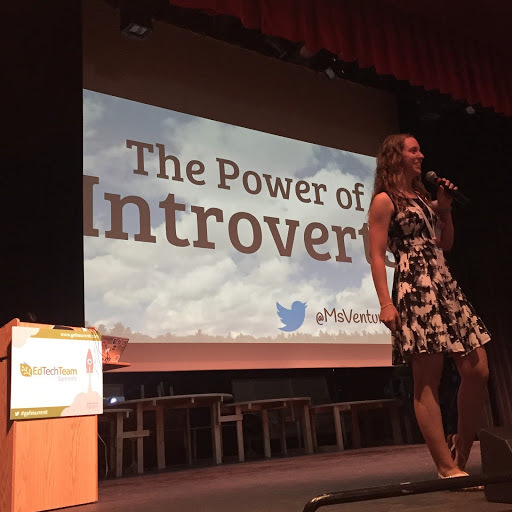 If you’ve met me in real life, you might not automatically know I’m an introvert–especially if I’m at an edtech conference. However, after I get home, I need plenty of time to decompress. This is a learned skill that took time to develop. In our classrooms, we value students who are collaborative and vocal. It seems that we’re condemned as “bad teachers” (gasp) if we don’t have our students constantly working together. After auditing my own classroom, I see how many of my lessons that the voices of my extroverts, and leave my introverts quiet and alone. I’ve been more intentional to build in opportunities for both introverts and extroverts to shine. So with this being said, how do we provide our introverts with an authentic voice in our classroom and world? PS. Not sure where you lie on the introvert-extrovert continuum? Take this free Myers-Briggs Type Indicator quiz to find out.